The rally comes as Planned Parenthood affiliates in Texas and around the country vie for funding and survival now that Republicans control both chambers of Congress, the White House and many state legislatures. Hundreds of people rallied in front of the Texas Capitol on Wednesday, calling on state legislators to stop trying to block Planned Parenthood from offering reproductive health services. 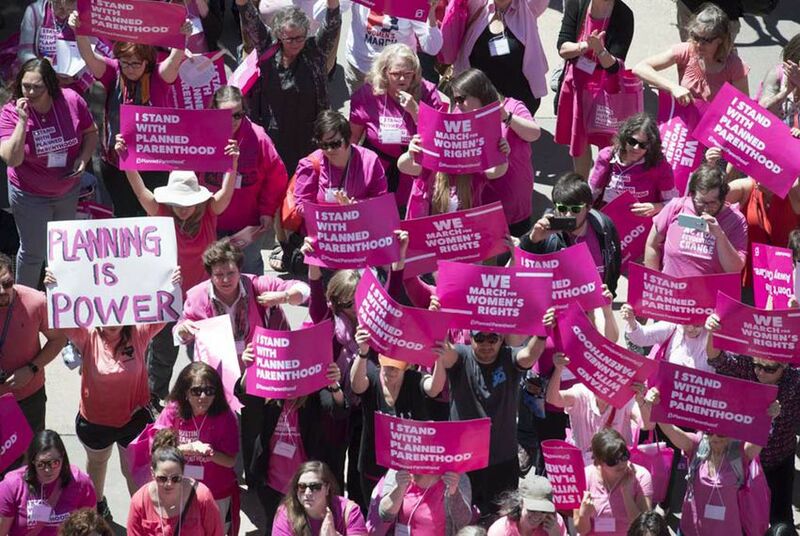 Clad in pink and holding signs reading, "I Stand with Planned Parenthood," "We March for Women's Rights" and "Don't Take Away Our Care," supporters of the women's health provider got charged up for Planned Parenthood's lobby day in Austin. Throughout the hour-long event, speakers talked about the potentially devastating consequences for low-income people, people of color, immigrants and the LGBT community if Planned Parenthood clinics were gone. Yvonne Gutierrez, executive director for Planned Parenthood Texas Votes, said "the stakes have never been higher" for the women's health organization and supporters needed to continue calling and watching legislators. "We're here to tell Greg Abbott and his sidekick Dan Patrick: Not on our watch," Gutierrez said of the governor and lieutenant governor. The rally comes as Planned Parenthood affiliates in Texas and around the country vie for funding and survival now that Republicans control both chambers of Congress, the White House and many state legislatures. Just last week, the U.S. Senate voted in favor of a bill that would allow states to decide if abortion providers like Planned Parenthood would be allowed to receive federal family planning program money. President Donald Trump is expected to sign it. In Texas, which has long been controlled by Republicans, state officials are seeking to remove Planned Parenthood from Medicaid, the federal-state health insurance program for low-income people and the disabled. Wendy Davis, a former state senator and gubernatorial candidate, said during the rally that Planned Parenthood was necessary to help women get critical access to cancer screenings and contraceptives. Davis came into the national spotlight in 2013 when she filibustered for nearly 13 hours on the Texas Senate floor to block a controversial abortion bill. Wearing bright pink as she spoke at the podium, the Democrat took swipes at Abbott and Patrick, saying they had "created a public health crisis" for women. Agreeing on reproductive health rights "happens when we take these tough issues out of the abstract and make them real and make them human," Davis said. "Reproductive care is exactly and simply and actually only about people ... That's why Planned Parenthood's mantra, 'care no matter what,' is so resonant." Reproductive rights advocates say they fear anti-abortion lawmakers are more driven than ever to block Planned Parenthood from funding and offering reproductive health care services including cancer screenings, STD testing, contraceptive counseling, pregnancy tests and abortion services. State and federal law already prohibits taxpayer dollars from being spent on abortion services. Planned Parenthood abortion services are offered separately from their clinics and made up 3 percent of procedures done in 2015, according to the organization’s latest report. The organization has faced more intense scrutiny since 2015 after the Center for Medical Progress, an anti-abortion group, released a heavily edited eight-hour video appearing to show Planned Parenthood Gulf Coast employees admitting to selling aborted fetal tissue for medical research. The widely debunked video led some states, including Texas, to try to remove Planned Parenthood from Medicaid. Planned Parenthood has called the video misleading and has vehemently denied such practices. That video was the Texas attorney general’s main evidence in federal court earlier this year when arguing why several Planned Parenthood affiliates in Texas should be removed from Medicaid. A federal judge ruled against Texas in February, citing that Medicaid patients would be denied their right to choose the provider they wanted and that the video was not enough evidence. Texas Attorney General Ken Paxton is appealing the ruling. U.S. District Judge Sam Sparks ruled that Texas clinics affiliated with Planned Parenthood can continue to care for patients under the state’s Medicaid program. Showing multiple clips from a video released in 2015 by the anti-abortion group Center for Medical Progress, state attorneys and witnesses said the footage was grounds for dismissing Planned Parenthood from Medicaid. Planned Parenthood lawyers and witnesses said in front of a packed courtroom that ending the organization’s reimbursements for Medicaid could endanger access to family planning services for Texas’ most vulnerable populations.